It’s finally finished! This project typifies what happens to me when I work on something that I can’t finish in one or two sittings at the machine – it takes much, much longer than it should to complete. I have a tendency to pick things up and put them down, and rather than pick them back up I move on to other projects that were planned more recently. Which is a shame, because look at how lovely this quilt is! A few more pictures are here, with more to come once the sun returns. As is typical for me, I did not immediately begin sewing this quilt. I cut the pieces in August 2011, and began sewing it in November. I do know, thanks to a photo, that I finished the quilt top in January 2012. As I hadn’t yet purchased batting, or fabric to back and bind it with, the quilt got set aside. 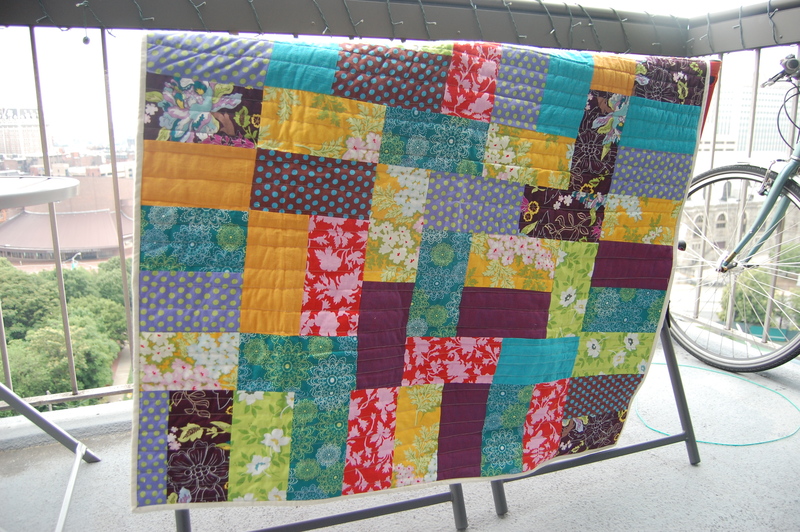 In April 2012 I picked it back up again and started working on the quilt sandwich, which I finished in May 2012. That was the most challenging part – getting the backing, batting, and top pinned together so I could quilt it. It took a lot of space, time and patience, and I did actually wish for the curved pins recommended in a quilting book I was gifted when I started the project. I lucked out and the dimensions of the top and backing fabric were such that I only had to cut the correct length of backing fabric. For the actual quilting, I just did parallel lines, roughly an inch apart. The width varies, and they aren’t perfectly straight, as I did it freehand. Overall I’m pleased with the look, though I think next time I might try doing the lines diagonally. I did find that this size quilt (I did the smaller lap size) was about the largest my machine can accomodate for the actual quilting part, so if I want to do something larger in the future, I’ll have to find a longarm sewing machine to rent or borrow time on. I will also need to get a walking foot for my machine – while I made it work, it wasn’t ideal. Once it was quilted, I had to cut things down a bit to line them all up properly for binding. At this point I do recall that I had to trim off some parts of the quilt top as things had shifted during sewing. I made a mental note at that point to start with a backing larger than the quilt next time around. I started working on the binding in October 2012. I was originally going to do a hand-sewn binding, and started that – you machine sew the binding to the front, fold it over so the seam is hidden, and use some sort of quilting voodoo to hand sew the binding down on the back invisibly. I got a little more than one side done using that method, which I simply found too time consuming. It was also a slow enough process that I had to spend time looking at every stitch that was slightly too long, which was driving me crazy. I decided to machine bind it, and finally actually did that yesterday afternoon. I looked at several tutorials, and liked how the finish looked on the backside using this method, but as I am having some sort of tension problems that prevent me from doing lots of zigzagging all at once, I had to pass that up for now. In the end I just did a straight stitch, through to the front of the quilt, right at the edge of the binding on the backside. Looks just fine. This was stupidly fast once I sat down and did it. Overall, this was an easy pattern to make, and I’ll probably do it again. The various pieces of the top came together quickly. You will want to label the different sections as you make them – they don’t fit together interchangeably, and I had to rip some seams out when I put them together wrong. I also found that I wound up with extra rectangles cut. I had purchased 1/4 yards of fabric, so I’m not sure if this happens if you work with fat quarters instead. But you might want to count as you cut if you don’t often find a use for smallish pieces of fabric.